Marie Antoinette loved jewels, and often got in trouble for it (even when she refused to purchase them!). During the years, she had amassed a sumptuous collection, most of which was unfortunately lost during the French Revolution. 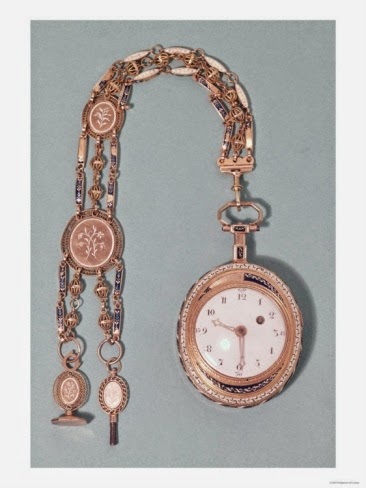 The pieces which Marie Antoinette managed to save with the help of faithful and trusted friends, and some of which were later returned to her daughter Marie Therese, were afterwards either recut and fashioned into new creations and cannot be traced anymore, or now belong to private collections, where only a select lucky few can see (and maybe still wear) them. Luckily for us, not all those who purchased Marie Antoinette’s jewels kept them for themselves. These beautiful diamond earrings ended up (possibly after the French crown jewels were sold; it is believed that the pear shaped earrings Napoleon III gave his wife Eugenie, who was fascinated by Marie Antoinette, were these same ones that had belonged to that unfortunate Queen) in the possession of the Grand Duchess Tatiana of Russia, from whose family Pierre Cartier bought them in 1928. The earrings were then acquired by Miss Marjorie Merriweather, whose daughter Eleanor Barzin donated them to the Smithsonian Institute in Washington (thanks Eleanor!). 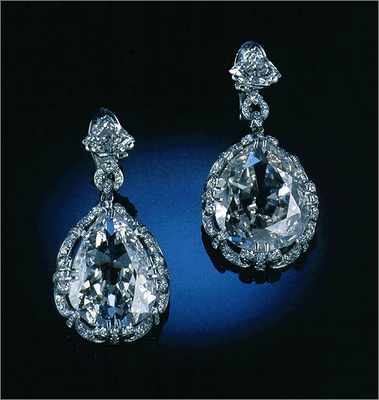 Said to be the Queen’s favourite earrings, they were a present from her husband, King Louis XVI. Apparently, they were taken from her when she was arrested. 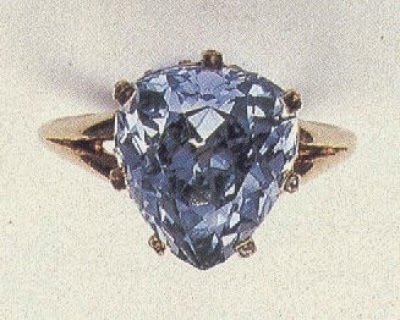 This blue heart shaped diamond belonged to Marie Antoinette’s private collection. The Queen had it set in a ring, which she then gave to her friend Princess Lubomirska in 1791. But the poor princess too was put on trial and condemned to death during the Terror. It then passed to her daughters. It changed hands several times afterwards, but was finally sold at auction at Christie’s in Geneva in 1983. Sadly for us, it is now in a private collection somewhere in Europe, rather than in a museum where it could be admired by everyone. Marie Antoinette used this big diamond, called the Regent, to decorate a large black-velvet hat. The diamond has a very colourful story. 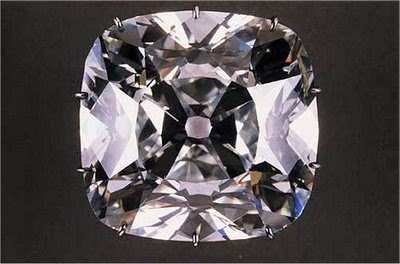 In 1701, a slave discovered the diamond, which was originally a 410 carat stone. He stole it, hiding it in bandages of a leg wound, and offered half its value to a sea captain in exchange for a safe passage on his ship. But the captain got greedy: he killed the slave and stole the diamond. He sold it for a pittance and then he felt so guilty he hung himself. The diamond was then cut into smaller gems, the biggest of which is 140.50 carats! In 1717, it was purchased by Philip II, Duke of Orleans and then Regent of France, from whom acquired its name. The gem was first set in the crown Louis XV wore at his coronation, and then, once removed, worn as a hair ornament by his Queen. The gem then disappeared in 1792 and was found again, 15 months later, in a hole in an attic in Paris. In 1797, it was pledged for money to help Napoleon’s rise to power. The French emperor then had it mounted on the sword he carried at his coronation. After his fall, it was taken by his wife Marie Louise and returned to France by her father. After the fall of the last royal house, most of the Crown Jewels were sold, but the Regent was instead exhibited at the Louvre. It was then hidden again when the Nazi invaded France during the Second World War and returned to the museum after the end of the conflict. How gorgeous is this necklace? Only the pearls belonged to Marie Antoinette, though. The unfortunate Queen gave them to Lady Sutherland, the wife of the British ambassador Leveson-Gower, right before her departure in 1792, when the embassy’s hurried withdrew for the country. Why her? Two reasons. One, because she was the wife of the British ambassador, Lady Sutherland enjoyed diplomatic immunity. Anyone without it, should have been found in the possession of these jewels, risked severe punishment. 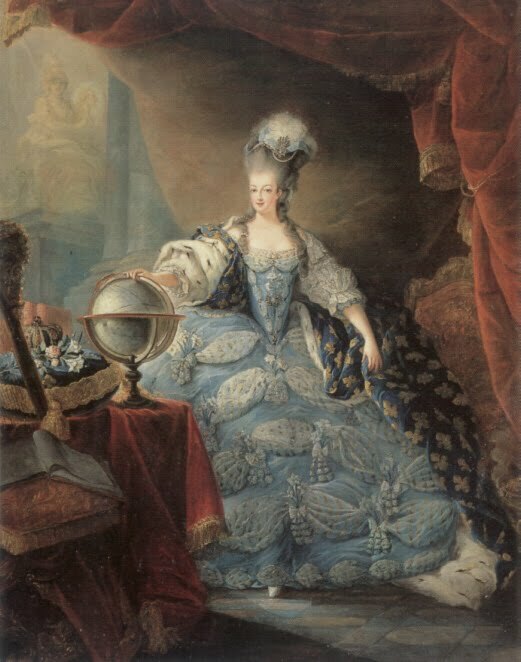 Two, this lady could be trusted to return the pearls to Marie Antoinette should she have managed to escape from her imprisonment. Unfortunately, that never happened. 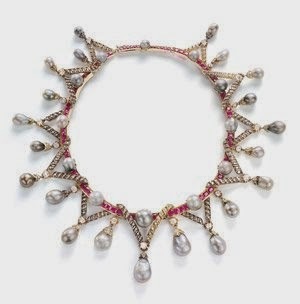 The pearls, together with the diamonds Marie Antoinette also gave to Lady Sutherland, were then mounted on this necklace. What do you think of Marie Antoinette’s jewel collection? Which piece if your favourite?